REVIEW - Dream - Use a Potion! Dreams are commonly explored in popular culture – be it the horrific murders by Freddy Krueger in the ‘A Nightmare On Elm Street’ movie series, or even using them to plant an idea in someone’s mind as seen in the movie ‘Inception’. There’s a freedom to be had from using dreams; they are made up from someone’s imagination after all, so it allows a real sense of freedom to create something that could be completely normal or utterly bizarre. 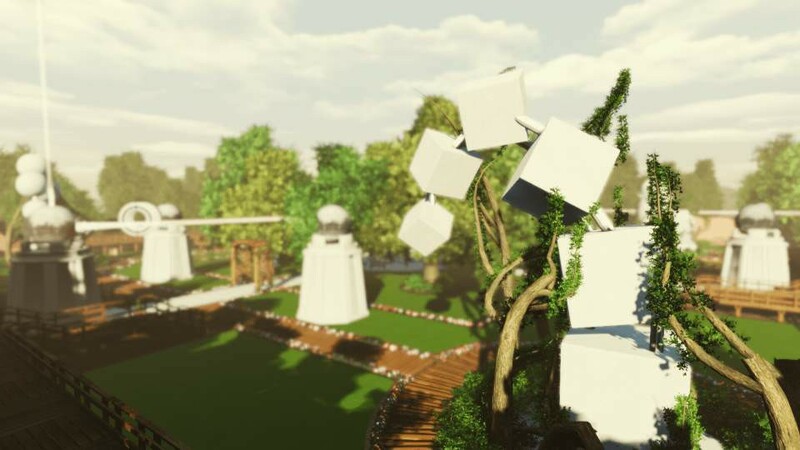 I know I’ve had a few dreams in my time that have left me baffled, and that is the premise of Dream – a puzzler from three man development team HyperSloth that has you exploring the dreams of a some-what troubled young man. The premise of Dream is quite simple – you take on the role of Howard Phillips, a young man who has inherited the home of his Uncle who has passed away, and explore the bizarre dreams he has been experiencing. There is not a lot of back story to open with aside from a brief conversation between Howard and his Uncle that took place awhile before his death. As you progress through the game you unlock more of the conversation which eventually reaches a somewhat abrupt and unsatisfying conclusion. There are multiple endings in the game though, so maybe I just happened to unlock the boring choice; either way the narrative is slightly ambiguous and never really had me invested in what was going on. Despite the main narrative being disappointing, the developers did manage to convey a more imaginative variety of themes with the many dreams and nightmares you visit in the game. For the most part everything has a peaceful tone, but there were times when the game would take a really dark turn – especially with the nightmares. One particular nightmare was especially creepy; shadowy figures were lingering around Howard’s home along with a blood-filled bathtub, the words ‘get your own place’ smothered on the walls in said blood. It really changed things up and really set up each dream you visit with its own individual vibe, something the developers should be commended for. It’s just a shame they weren’t able to keep the main narrative as engaging; it’s fortunate that it’s not pivotal for the enjoyment of the game. 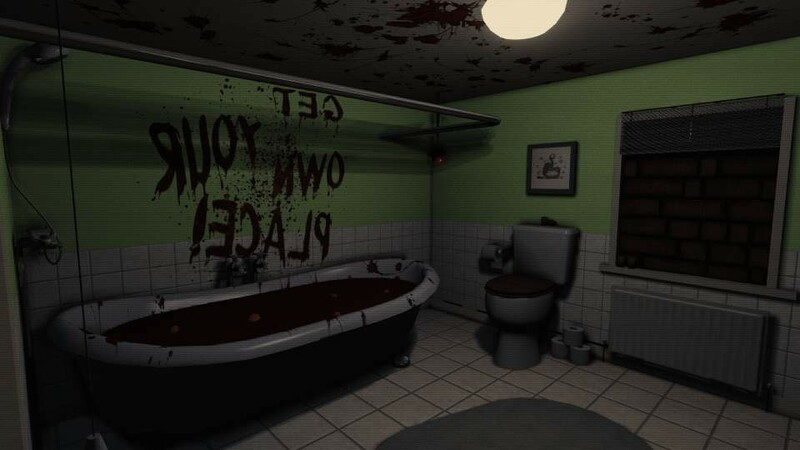 The game is controlled from a first person perspective, opening in Howard’s home. From here you can explore each room, interacting with objects that Howard will briefly describe. It’s a nice little area with a few hidden extras that are neat to discover – I particularly liked that interacting with a box of Christmas decorations resulted in the whole house being given a festive makeover. Of course, the main gameplay takes place within Howard’s dreams – these are accessed, obviously, by going to sleep. Your initial dream state takes place in a sort of hub, each dream accessible via a gateway. As you complete each dream a new gateway unlocks, offering you a new dream to explore. Any collectible items you find are also displayed here – I didn’t manage to find them all but I amassed quite a collection by the end. Dream features three main ‘dream’ based levels, each one followed by a ‘nightmare’ section that takes place in Howard’s home. Each level is typically well designed, albeit some slightly more so than others. 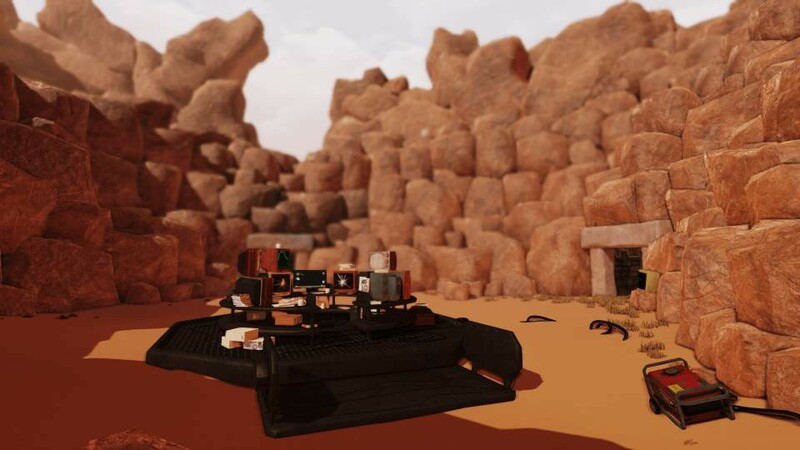 My personal favourite design the desert dream; a bizarre environment covered with computers and strange catacombs. Of course these are dreams and anything can happen, perfectly represented by the snowfall that appears in the desert. It’s really neat level design – the developers had the freedom with their creativity and it especially shines through in this dream. Unfortunately the other dreams don’t always reach this quality (the second dream mainly taking place through a boring office complex) but that doesn’t stop them all having at least some individual quirks that induce a sense of originality. Each dream’s main focus is a series of puzzle that require completion in order to progress; some are very simple puzzles whilst others require a bit more thinking if you’re going to solve them. Some of the puzzles are actually quite clever and took some creative thinking by the developers to design – I won’t go into details but lets just say the previously mentioned office complex is home to some of the more trivial puzzles. There are no truly perplexing conundrums that will have you stuck for hours mind – your brain won’t get strained but you will certainly enjoy completing them. Each puzzle has its own individual feel, some puzzle styles only repeating on few cases. There’s plenty of variety and in most cases there’s a real rewarding feeling in solving them. 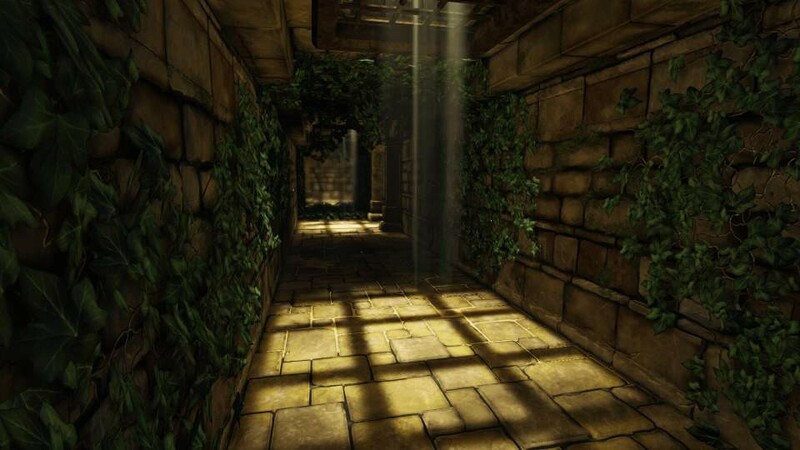 That being said a couple puzzles weren’t so enjoyable; walking around mazes aimlessly switching off every light became slightly boring by the second time I had to do it; it’s something I didn’t mind once but three extra times was too much. You were often required to remember login details to computers too – the information for these was easy to find and typically clearly indicated. These are just a couple of examples of the more lazy puzzles, made all the more frustrating when most of the puzzles had a much more clever design. It’s a mixed bag, though fortunately they’re typically more enjoyable than not – it can’t be held against the developer as for the most part the quality is so high. There are plenty of discoveries to make along the way – there are collectible items, dream meanings and side dreams to complete. The game certainly isn’t short on content, easily lasting you around five to six hours to complete. These are well spent hours too – Dream does a good job of making sure nothing feels like filler. One thing I should point out is that there were a few peculiar glitches within the game. I noticed that controls were often unresponsive and jittery, often making the most simple tasks such as interacting with an object a chore. Sometimes I found the collision detection completely off too – I would be atop of large obstacles simply by being near them. There have also been other bugs reported by other players but the developers have been hard at work ironing those out with quick fire patches since launch. Fortunately nothing too drastic happened during my playthrough and it seems HyperSloth have fixed most issues now, though it’s worth mentioning not all players had such a smooth experience as I. The visuals of Dream are fantastic; made all the more impressive when you consider that the development team was so small. Everything looks crisp and smooth and are in abundance with tiny details. The freedom was there to create interesting, bizarre environments and HyperSloth certainly did so to a high quality. Each environment is atmospheric and just a treat to explore. There are a few graphical hiccups here and there – especially with shadows – but otherwise Howard’s dreams are beautiful to explore. Just don’t look at your character’s reflection in the mirrors in-game – the character model is not a pretty sight. Despite the strong visuals and enjoyable puzzles I found that one of Dream’s biggest strengths was its soundtrack; it’s simply fantastic. Everything fits the tone of the dream you’re in perfectly, with pleasant compositions playing in the more peaceful dreams but also exciting upbeat tunes when you’re making a grand discovery. The composer did an amazing job – up there with any triple-a soundtrack. The voice acting on the other hand is very boring. Whilst I don’t feel like the voice actors did a terrible job, I just didn’t find it believable. Both voice actors sounded exactly the same – it was only when the credits rolled that I realised there were two actors credited – and delivery just isn’t up to scratch. Whilst not horrible, it could have just been so much better – especially when Dream has set the bar high with its sound design in other areas. I played Dream to completion I found myself wholly satisfied. Whilst it’s not a game that everyone will go crazy for, I had a great time from start to finish. The visuals were awesome, puzzles were well designed and the music was simply spectacular – it’s all the more impressive considering the small development team behind the game. The game does have its flaws – some of the puzzles are lacklustre, the voice acting is boring and the lacking narrative ends with a whimper rather than a bang; these flaws don’t make Dream a nightmare though but are minor gripes in what is otherwise a great experience I’d recommend any puzzle fan to play.